Tear through your bucket list on this 12-day group adventure to China. From learning Kung-Fu and Tai-Chi at the serene Temple of Heaven, to zipping through Beijing in a vintage sidecar motorcycle, this is a trip of endless highs. Your unforgettable experience at The Great Wall will be topped with a five-star spa hotel stay and an epic sunrise from your own private viewpoint. We’ll haggle our way through the market stalls of Silk Street, and jump on a night train to historic Xi’an and its famous Terracotta Warriors. On to Chéngdū, we’ll get up close with Lè Shān’s Giant Buddha by boat, meet the giant pandas, learn Sichuan cooking and discover Wénshū Temple. Keeping up? Good, because our last stop will be Shànghǎi to learn ping pong from champions, uncover the vibrant arts scene and delve into the wild nightlife. Buckle up Flashpackers, this is an eastern journey unlike any other. This eclectic townhouse sits on Huguosi Hutong street, with food stalls, boutiques and antique shops selling musical instruments all on your doorstep. This age-old district feels more like “real” Beijing, although the major tourist sights are still only a few metro stops away. Each room is individually decorated with modern Chinese flourishes, and the breakfast terrace offers a beautiful glimpse of street life just below. Flashpackers, welcome to day one of your escape to China. Touch down at bustling Beijing Capital International Airport in the morning, and a private transfer will be waiting to whisk you to your hotel, just a 30-minute drive away in the happening Dongcheng District. Today is your chance to settle into what will be your base camp for the next two nights, and soak up your first taste of China’s colorful and fast-paced capital city. Head out and crane a look at the towering skyscrapers lining your new location, catch up on some sleep, or if you’re feeling energetic, you could make use of the hotel’s gym. You’ll want to be refreshed for the evening though, because you’ll be meeting your guide and full Flash Pack crew to discuss the adventure that lies ahead and gorge on delicious Chinese food at a local restaurant nestled in one of Beijing’s famous hutong courtyards. Today is all about delving deep into the capital. 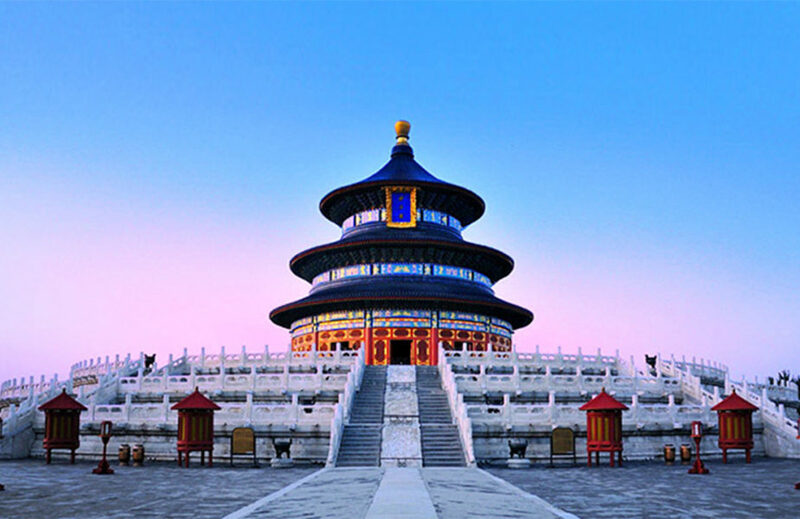 First up, we’ll head to Beijing’s Temple of Heaven Park, an oasis of surprising serenity sitting south-east of the frenetic city center. Visit the temple, built during China’s Ming dynasty, join locals for morning exercises – thought to be an elixir of youth for Beijing’s elders – then dive right into the ancient arts of Kung-Fu and Tai-Chi with a lesson from a master in the temple grounds. After a pit stop for an artisan brew at a nearby coffee hotspot, you can venture off to explore the city’s plethora of tantalising lunch options. We’ll regroup in the afternoon to explore the city’s rich seam of historical landmarks and ancient architecture, including iconic Tiananmen Square and the palatial splendor of The Forbidden City. Then we’ll push on to the imperial Jingshan Park to bask in a panoramic view of the city from Beijing’s highest peak. The day will end in true Chinese style: a feast of Peking duck with your new Flash Pack pals. Don’t skip your green tea this morning, you’ll need energy for today’s jam-packed schedule. First up: explore Beijing in a vintage Chang Jian 750 sidecar motorcycle, speeding around the city for a two-hour discovery mission like no other. Adrenaline amped, say farewell to Beijing’s inner city bustle, and board the Flash Pack bus for a two-hour jaunt to the city’s outskirts, where we’ll hike two to three hours through the Jundu Mountains. We’ll steer you away from the crowds at Badaling and make for a secluded section of the Great Wall, where you can take in the idyllic views. An awesome day needs a hotel to match and the five-star Commune By The Great Wall fits the bill perfectly. Make for the hotel’s luxurious spa, take a dip in the outdoor swimming pool, dine at one of the hotel’s three restaurants, or gaze upon the Great Wall from the hotel’s private vantage point. We’re making the most of this incredible location by rising early to witness the sunrise over the hotel’s private section of The Great Wall. Cameras filled with inspiring photos, make the most of your last few hours here by lounging poolside, enjoying a treatment, and lunching at either the hotel’s Terrace Lounge, boasting views across the Shuiguan mountains, the Courtyard Restaurant with its menu of regional Chinese delicacies, or the Poolside Cafe. Then it’s time to check out and put your haggling skills to the ultimate test at Beijing’s famous Silk Street Market. From silks and cashmere to jewelery and local handicrafts, you will leave laden with treasures. You’ll have plenty of time to compare your haul with your fellow Flashpackers when we board tonight’s Soft Sleeper night train for a 12 hour journey south-west to Xi’an. Wake up in Xi’an and grab some breakfast on the fly, before immersing yourself in the city’s rich history with a calligraphy lesson. Check into your hotel where you’ll have a chance to freshen up, before heading out to explore the city on bike. We’ll cycle around the top of Xi’an’s City Walls, the largest ancient military defense system in the world, then leave you free to explore the area and its impressive cuisine. Here you’ll find a whole host of delicious fusion dishes in Xi’an, from roujiamo, the Xi’anese take on hamburgers, to spiced lamb skewers and yangrou paomo (shredded flatbread served in an aromatic mutton broth). Come evening, we’ll explore the Muslim Quarter, a hotspot for cool eateries and places to gather, and see the impressive Drum and Bell Towers illuminated at night. Finish the evening with an introduction to Xi’an’s growing craft beer scene, and share a toast with your fellow Flashpackers. We’re on the move today – this time with a 90-minute drive to Emperor Qin Shi Huang’s Mausoleum Site Museum, home of Xi’an’s Terracotta Warriors. A UNESCO World Heritage Site, the Terracotta Warriors stand life-sized in battle formation, thought to be ready for action should Emperor Qin Shi Huang come under attack in the afterlife. Afterward, it’s all aboard the bullet train, for the 658km journey to Chéngdū East in the Sichuan Province. The journey will take around four hours, passing through the crop fields of central Shaanxi Plain, the lush greenery of the Qinling Mountains and the forests of Sichuan Basin. We’ll get you checked into your new hotel in the Jinniu district in the heart of Chéngdū and then you can head off to explore the city’s street food scene. Wontons on Táng Sòng Food Street are a must, as is Sichuan favourite tùtóu (not for veggies – it’s rabbit head). Today we’re driving three hours south to Sichuan city Lè Shān, home to the world’s tallest stone Buddha. At a whopping 71 meters tall (each finger alone is eight meters), the Lè Shān Giant Buddha took 90 years to complete. Bring your selfie game for this because to help you take in the vast monument, we’ll jump aboard a boat and glide along the shores of the dramatic Min River to capture it from the water. Back on dry land, it’s back to Chéngdū – we’ll delve into the local cuisine, discovering Sichuan’s best-known traditional dish – a belly-warming hotpot of spicy broth laden with meats and vegetables. The rest of the day is yours to explore the city. We suggest that includes a visit to Kuanzhai Xiangzi (three ancient parallel wide and narrow alleys) to discover Chinese teahouse culture and sip a jasmine brew, along with a visit the grand Taoist Qīngyáng Temple. Today is all about the cute and fluffy as we rise early to visit Chéngdū’s panda reserve. Just 18 kilometers north of the city, this reserve is your best chance to see China’s most famous residents outside the confines of a zoo. A sprawl of wild bamboo forests, lakes and caves on Futou Mountain, the Panda Base reserve is home to over 80 giant pandas who can all be seen lolling about their dens and munching on bamboo. You’ll also get a glimpse of the lesser-known red panda, and endangered Chinese wildlife including colorful peacocks and black swans. Afterward, we’ll head back into the center of Chéngdū for a cookery class with a local Sichuan chef. A hands-on experience, you’ll learn the art of cooking with the area’s famous red peppercorn, whipping up a hot and spicy meal to savor with your Flash Pack crew. To top the day off, we’ll spend the evening watching a powerful Sichuan opera. This morning we’ll head to Chéngdū’s Tibetan Quarter in the southwest of the city to take in the city’s largest and impressively-preserved Buddhist temple Wénshū Temple (AKA Wénshū Monastery). Then we’ll visit the People’s Park – a lush 112,600 square meters of heritage landmarks – to take part in a traditional tea ceremony. This is our last day in Chéngdū so we’ve left lunchtime free for you to potter before we head to Chéngdū Shuangliu International Airport to hitch a flight to Shanghai, the final destination of our Chinese adventure. The flight will take around three-and-a-half hours – just enough time for a snooze and a film – and then we’ll whisk you off to your new hotel, perfectly located in Shanghai’s lively Huangpu District. It’s up to you how you spend your first night and there’s plenty to entertain you, from the wild nightlife to the impressive foodie scene. It’s a slow start today, so we recommend you make the most of this energetic city by exploring the hustle along Nanjing Road, the world’s longest and busiest pedestrian shopping street. After that, try walking to the foodie hotspots along Chenghuangmiao Old Street, Huanghe Road or Yunnan South Road and tucking into steamed buns, pork balls or spare ribs with rice cakes. If you’re a fan of sweet and sour, you’ll find your happy place in Shanghai’s traditional Hu cuisine. Regrouping early afternoon, we’ll visit Shanghai’s historical waterfront The Bund, now home to a photogenic medley of architectural influences. This is also the best spot to get a snapshot of Pǔdōng’s futuristic skyline across the water. Next stop is the beautifully intricate Yùyuán Gardens, before we stop-off to sample Shanghai’s famous Xiao Long Bao dumplings. Later, we’ll head out to catch a performance of the spectacular ERA-Intersection Of Time acrobatic show. It’s the penultimate day of our Chinese adventure and we’re seizing every moment. First up: Shanghai’s Propaganda Poster Art Center, a private underground museum bursting with over 6000 pieces of rare propaganda art circulated by Chinese governments between 1940 and 1990. Next stop is Tiánzǐfáng, an arts and crafts enclave in the French Concession. Feel free to root around the artsy stalls, design studios, galleries and boutiques, or grab lunch in one of the area’s hip bars and cafes. Then it’s time to mine your competitive streak for a ping pong masterclass from a professional player. Come nightfall, we’ll head to the Vue Bar, which sits atop a luxury hotel high above the Bund, where you can sip champagne while dipping your well-worn feet into a whirlpool bath. Then it’s time to dine out one last time with your fellow Flashpackers and toast the 11 epic days you’ve just shared together. Fly into Beijing International Airport (PEK) and out of Shanghai International Airport (PVG).